We must admit that it was this Cigees Classic Starter Kit that drew our attention. The actual packaging is nothing to brag about, but the kit itself is bloody brilliant. The packaging is black and is rectangular in shape with the Cigees name and logo on the front of the box. It’s really quite standard. However, once you open the package, the design catches your eye quite well. Why? It looks (and feels) like a regular pack of cigarettes. The flap on top even bends backwards just as you would open a pack of cigarettes. Once you bend the flap back, you are greeted by one automatic battery, 2 cartomisers and a detachable USB charger. While these are the only contents of the kit, it makes for a wildly interesting transition to e cigarettes – in fact, one of the best in this regard. The Cigees Classic Starter Kit comes with one 240MAH battery. While it is not the most powerful on the market, it certainly holds its weight. Our review concluded that this battery lasts about 200 puffs (4 hours of standard vaping usage). While you can get more from other companies who sell more powerful batteries, the value proposition here is unquestionable. Besides, unless you are a chain smoker, 4 hours is plenty. The actual responsiveness of this battery though underperformed a bit. You will need to take a few “primer puffs” to really get it started. There is also a bit of a whistle sound to it while you inhale. However, there is no need to pull hard. This battery provides for a very easy and smooth vape. The vapour volume performed just like the battery. There were minimal vapour clouds when we exhaled after our first 4-5 drags. However, after that, we were a bit surprised to see how much vapour came out, especially since our first few puffs were disappointing. Interesting enough though, the throat hit was outstanding from the very first hit. Perhaps that is because we tried the 16mg cartomiser which is a nice amount of nicotine. Either way, we were impressed by this. As for charging times: it took us just under 2 hours to charge the battery that came with this kit. Not “exceptional” considering it is not such a powerful battery to begin with but definitely one of the best on the market in terms of overall charge time. You will be hard pressed to find a battery that charges from dead to full in under 2 hours. We also make mention below that we purchased a second Cigees starter kit (the CE5 Refiller Starter Kit). This comes with an 1,100MAH battery which is the largest we have ever seen in real life. It lasted well over 1,000 drags. The performance was nothing short of stellar. While the pre filled cartomisers last about 150 drags, the fill it yourself e liquid lasts close to 250 puffs! This is better than both V2 Cigs and Jac Vapour. Additionally, the quality of the e liquid is amazing. 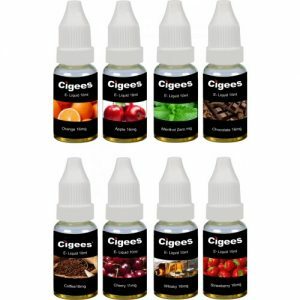 Cigees offers 14 e liquid flavours that are tested in their warehouse for quality assurance: Tobacco, Menthol, Menthol Extra, Coffee, Cappuccino, Cherry, Liquorice, Apple, Orange, Strawberry, Vanilla, Cigar, Whisky, and Chocolate. We strongly recommend Tobacco, Strawberry and Vanilla. 16mg – excellent for your average smoker. 11mg – great for smokers who enjoy the equivalent to Marlboro Lights. 6mg – good for smoker who prefer a slight hint of nicotine. Note that you cannot choose your nicotine level with the pre filled cartomiser kits. They are all packaged to deliver 16mg of nicotine. You can only choose your nicotine strength with an e liquid kit (which we prefer over the Cigees Classic Starter Kit). For a relatively new e cigarette company, we were surprised to see the options AND level of customer service provided by Cigees. You can contact them via their web form (e-mail) or by Phone Monday-Friday 9AM-4PM. This is pretty typical for a company and their customer service department. However, the friendliness and professionalism of the Cigees service representatives legitimately rivalled that of Green Smoke’s. A+ for Cigees in this department. Aside from Green Smoke, there may not be a better e cigarette value play on the market. For the quality of flavours, nicotine, battery performance and vapour volume, factored in with the wildly low price point, Cigees price cannot be beat. They offer several products but not too many that will overwhelm you. The one downside to Cigees is that we did not find any kind of money back guarantee or warranty on their products. This was a bit disappointing for us but for a starter kit with a price tag of £15, we really cannot complain. Besides, the Cigees e cigarette more than outdid our expectations. Like Jac Vapour, Cigees has one of the best shipping processes of any UK e cigarette company. Cigees uses First Class Royal Mail. Your order can arrive on the same day so long as you order early enough. If not, it will arrive the very next day. Cigees also has a special delivery option which guarantees a next day arrival date (unless the order is put through on the weekend or after 4PM on Friday). Shipping costs are about £4-8 depending on the order. However, if you order over £50 worth of Cigees products, shipping is free across the UK. We were so impressed by Cigees that we needed to place them in our top rankings. There are some noticeable downsides, such as no money back guarantee and a limit on choosing your flavours on the pre filled cartomiser kits. However, if you can get past that, Cigees offers one of the best electronic cigarettes on the market. For the level of overall quality you receive and a price of £15, there is absolutely no reason not to give them a try.